Coming soon to the Arcade Gachapon September 2013 Event! Sculpted from living flesh! Enhanced with advanced materials! Five Monstrous Styles! Twenty Creepy Colors! 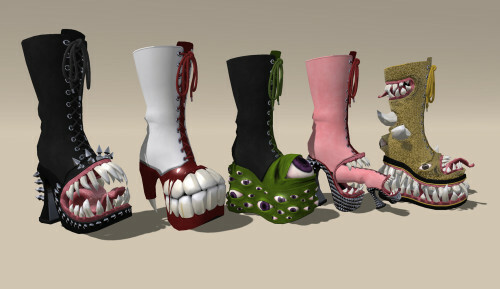 One Hundred Abomination Boots! Abomination Boots are rigged to match your size and have been enhanced with the new normal mapping and shine mapping effects (although they still look great even if you turn off the materials effects). Land impact is about 4 LI per boot.